I know I already have a post about exersaucers, but now I have a bit more experience and am ready to share more. 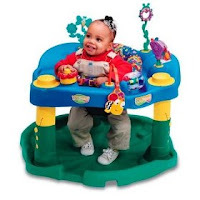 Hila has now been sitting in the very basic, cheapest on the market, Evenflo Exersaucer. Evenflo makes a bunch of different exersaucers of varying complexities and prices, but I would say that all you need is this one. It has seven removeable toys. No lights, no music, no overhead arch. No ADHD-inducing frills. Nothing fancy at all. She has been sitting there for about 45 minutes, using her legs to hoist her body around 360 degrees from toy to toy to toy, spending a few minutes at each toy before moving on. This exersaucer has height adjustable legs (she's at the shortest for now), so I imagine it will last a few months. It is a bit clunky and takes up room and it's "compact fold" is anything but. And like all Evenflo Exersaucers, the toys are removeable and exchangeable, so when she needs a change of scenery, that option is available.